On Sunday, March 7, 1965, roughly 600 African Americans and their allies gathered and marched towards Montgomery, Alabama in order to take a stand and draw attention to the fact that 99% of Selma, Alabama’s registered voters were white, and that the African American community was being denied their legal right to vote. 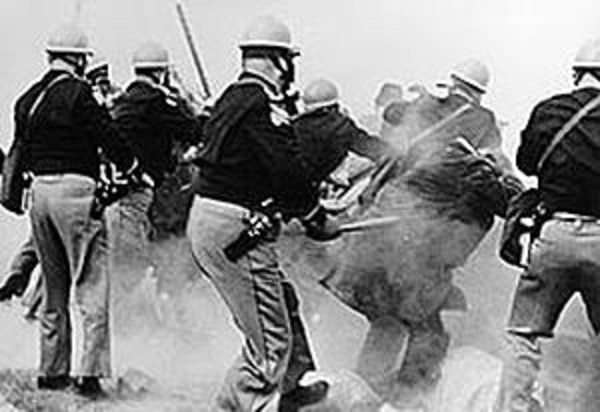 The unarmed men and women who marched across the Edmund Pettus Bridge were met by a heavily armed police force and were tear gassed and beaten horrifically. In the end, 17 marchers were hospitalized, and another 50 were treated for injuries caused by the police. On Sunday, November 20, 2016, more than 400 Native Americans and their allies marched on the Backwater Bridge outside of Cannon Ball, North Dakota. The Water Protectors had been demonstrating peacefully for months in order to preserve sacred burial grounds and protect their only source of clean drinking water from the oil-bearing Dakota Access Pipeline. However, this unarmed march was meant to clear vehicles that had been set up by DAPL to block the Backwater Bridge. They were attempting to clear the road so that emergency medical vehicles could have faster access to the residents and campers at the Standing Rock Sioux Reservation. After being trapped on the bridge by heavily armed police, the marchers were hosed with water cannons in 23°F temperatures, and shot with rubber bullets, tear gas, pepper spray, and concussion grenades for more than 7 hours. 26 people were hospitalized, and more than 300 were treated for injuries caused by the police forces. It is highly likely that neither group of marchers knew the full extent of the violence that they were about to experience as they marched on these bridges for the first time. However, they certainly knew what was in store for them for any subsequent actions. After the first march on Montgomery, the nation was horrified by the images broadcast by media sources, and on March 9, more than 2500 people showed up for the second march on Montgomery. Due to a pending decision, and a restraining order issued by Federal District Court Judge Frank Minis Johnson, the marchers turned around on the Pettus Bridge. Ultimately, on March 17, Judge Johnson ruled that the civil rights activists’ right to march could not be abridged by the state of Alabama, writing “The law is clear that the right to petition one’s government for the redress of grievances may be exercised in large groups…by marching, even along public highways.” Meanwhile, on March 13th, President Lyndon Johnson met with Alabama Governor George Wallace in an attempt to prevent further violence and harassment from being directed at the civil rights activists. While unsuccessful with Wallace, President Johnson introduced a bill two days later to Congress. That bill became the Voting Rights Act. While it took time for the bill to pass, President Johnson deployed 2000 soldiers of the U.S. Army, 1900 Alabama National Guard troops under federal command, and unknown numbers of FBI and Federal Marshals to protect the demonstrators as they successfully continued their march on March 21. When I showed up on November 24 to bring supplies and provide medical support at the Oceti Sakowin Camp, there were an estimated 3500 people at camp. When I left at the end of the week, there were roughly 10,000. Dozens of countries, and hundreds of tribes from around the world are expressing outrage and concern over the violence and harassment directed towards the Water Protectors at Standing Rock. These communities are also outraged that the pipeline was originally supposed to pass north of Bismarck, ND, but was rejected as being too dangerous to pass near that overwhelmingly white community’s water source, and instead was relocated to pass through traditional Lakota lands and under their Missouri River water source without any conversation regarding indigenous concerns and opposition to the pipeline. Governor Jack Dalrymple of North Dakota is escalating his rhetoric towards the safety of the people camped at Standing Rock. He has threatened anyone bringing food and clothing donations to the camps with $1000 fines. This week, he threatened to oust the Water Protectors from their camps in the name of safety, due to winter conditions. However, the Water Protectors are not going to leave, and making someone homeless in winter is unconscionable. Using water cannons on peaceful demonstrators in sub-freezing temperatures shows that safety is not Dalrymple’s top priority. Getting people to vacate the land is his priority. The Water Protectors are going to continue to march, pray, and peacefully demonstrate, regardless of the violent reactions from DAPL security and police forces. They are doing everything that they can to stand up for their rights in a peaceful manner. They are waiting for action from President Obama. It is time for a sit-down between President Obama and Gov. Dalrymple. It is also time for an immediate and decisive response from the Obama administration to ensure the safety of peacefully assembled citizens and their right to clean water. This means troops standing with the Water Protectors, not opposed to them. President Johnson was not perfect, but he has been judged by this nation, and the world, to have been on the correct side of history on civil rights in the wake of Bloody Sunday. Due to the shared history of abuse and denied rights, despite laws and treaties on their side, it is difficult to see why President Obama praises one group’s actions, but has yet to do anything of substance for the other. When will troops protect the Water Protectors? So far the only troops acting in such a capacity are the veterans recruited by Wes Clark Jr. My thanks go out to Mr. Clark and his veterans. However, anything short of deploying troops to protect the peacefully assembled demonstrators, in conjunction with pushing a bill through Congress to extend the rights of indigenous communities over the governance of their own land, would be a shameful act by the Obama administration. This is your Pettus Bridge, Mr. President. On which side of this historic bridge do you stand? Taking the least effective route to enact change is not praiseworthy. A teacher would award a D for such effort. While the ruling by the Army Corps of Engineers sounds nice, demonstrators are still fighting for Lakota rights on land that is considered to be federally-owned, but was granted to the Lakota “in perpetuity” by the government. The Lakota never relinquished their right to this land. The government took it. There are still Federal Police and Army Corps vehicles on Lakota land. They are still on the north side of Cantapeta Creek…with the DAPL security forces. I will believe something has changed when Federal forces are standing shoulder-to-shoulder WITH the Standing Rock Water Protectors, indigenous rights have been extended by law, and the pipeline is re-routed or terminated. Until this happens, nothing has changed. Noah Weber is a nurse and a farmer from Montana. He volunteered as a medic at the Oceti Sakowin Camp at Standing Rock, though most of his time went to ensuring everyone in the medic, healer, midwifery, and warming tents had wood, warmth, and functional stoves.